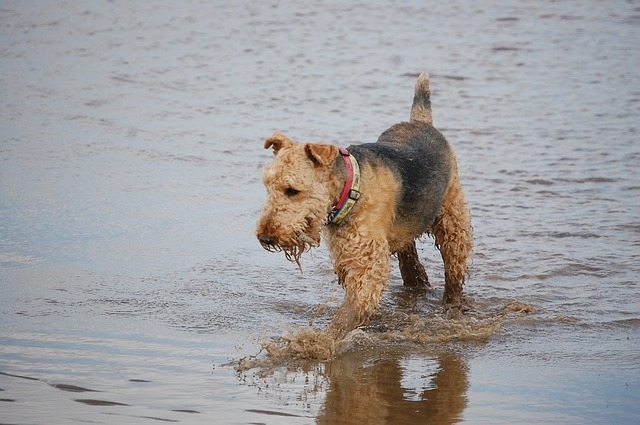 Originally from England since the 1800’s, the Airedale Terrier’s were breed to hunt badgers and otters. Today, they are guarding and police dogs. 23 inches in height and 55 LBS in weight for both the male and females. These are the tallest terriers, and the curly haired dogs are also known as the Waterside or Bingley Terrier. This breed of dog has a very cognitive mind and they learn quick, and easily. Their intelligence has given them opportunities to work in the military as well as in the white house as a family pet. Although the Airedale’s are very talented they can also be very clownish, but mostly they are entertaining and sweet. They have the largest teeth out of the terriers but that’s nothing to worry about because they make a perfect dog to owners with kids. The “King of terriers” have a non-shedding double layered coat, but need to be brushed to remove dead hair roughly twice a week. This is because it can feel wiry. A 20 minute walk each day is a requirement. Sometime to run around on their own and be free is also much loved because of their hunting instincts. In Latin, Airedale means earth which gives them the interest to explore what’s around them. They will chase small animals but they adapt to all environments. The lifespan for these dogs are about 13 years. Based on their structure, health concerns to keep in mind are related to bone and joint issues. The Airedale Terrier’s love a family lifestyle but are shy around other dogs but still well mannered. A dog like this could become the greatest friend you’ve ever had, perhaps this August.